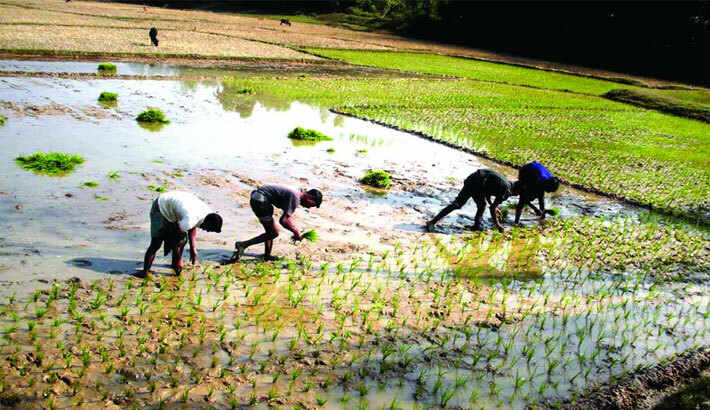 The Department of Agriculture Extension (DAE) has taken massive programme to cultivate Boro paddy in all six upazilas of the district in the upcoming Boro season. The DAE sources said, under the programme, a total of 84,229 hectares of land would be brought under Boro cultivation in the district with the production target fixed at 3,57,358 tonnes of rice. To cultivate the paddy in the field, the seedbed has been prepared on at least 4,970 hectares of land, DAE sources said. Now, the farmers are busy to prepare the seedbeds on the low land with the hopes of growing healthy seedlings for getting desired production through transplanting those. Deputy Director of DAE M Abul Kashem Azad said the farmers of the district are making up their mind to put in their best efforts to achieve the targeted production of the paddy. The field-workers and crop specialists of the DAE have started rendering their field-level services and exchanging views with the farmers to educate them about the modern method of Boro cultivation for achieving best yielding rate with minimum production cost, the deputy director added.